I think space stamps collecting is great fun. I think this is because I remember being excited about the first moon landing. 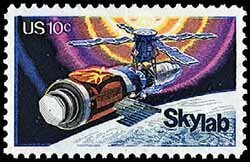 Space is such a fascinating subject and there many stamps dedicated to it , which makes them great topical stamps to collect. Space has always fascinated me and that is probably why I like space stamps. Born in the 1960s I remember the first moon landing and thinking I could see one of the astronauts, possibly Neil Armstrong, waving from the moon. I think it is one of man’s great achievements. I have included a video below of the moon landing below to relive that great moment. 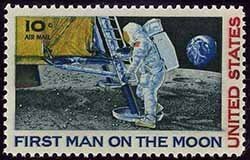 One of my favorite space stamps is the 10-cent American 1969 stamp of the moon landing called the First Man on the Moon which shows the historic moment when an astronaut steps down from the landing craft on to the moon. The actual dye for the stamp travelled with the astronauts to the moon. It is rightly considered one of the top 100 greatest American stamps. The first space stamp issued by the United States was issued in 1948, which commemorated the Fort Bliss Centennial depicting a rocket blasting off. In 1962, the first American in space was commemorated with the Project Mercury stamp that was held under lock and key until John Glenn safely splashed down. In 1967, the first spacewalk of an American was commemorated with a double stamp with one showing the spacecraft and the other the astronaut (Edward Higgins White II). Skylab, Apollo-Soyuz test, mission to Mars, space shuttle, and the 20th anniversary of Apollo 11 are some of the other achievements honored. The next stamp planned to be issued is to honor the first Mercury Probe and first American space astronaut, Alan Shepard, Jr., which is to be issued as a double stamp. However, the US is not the only county to issue space stamps, nor is it the only country in space, of course. The Russians played a big part in the space race to the moon. China and Europe are now active in space too. Hopefully, it will not be too long until we are back on the moon and on our way to Mars.